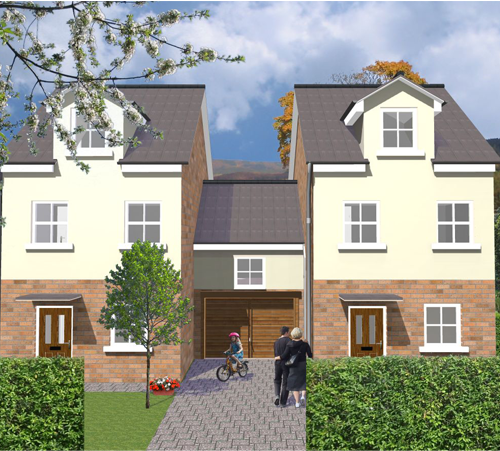 House builders who need detailed working drawings and accurate floor plans will benefit from the ease of use of 3D Architect Home Designer Pro - home builder software. This construction planning and building design software is an easier alternative to more complex CAD drawing programs for creating facility plans building plans, office layouts and other architectural projects. 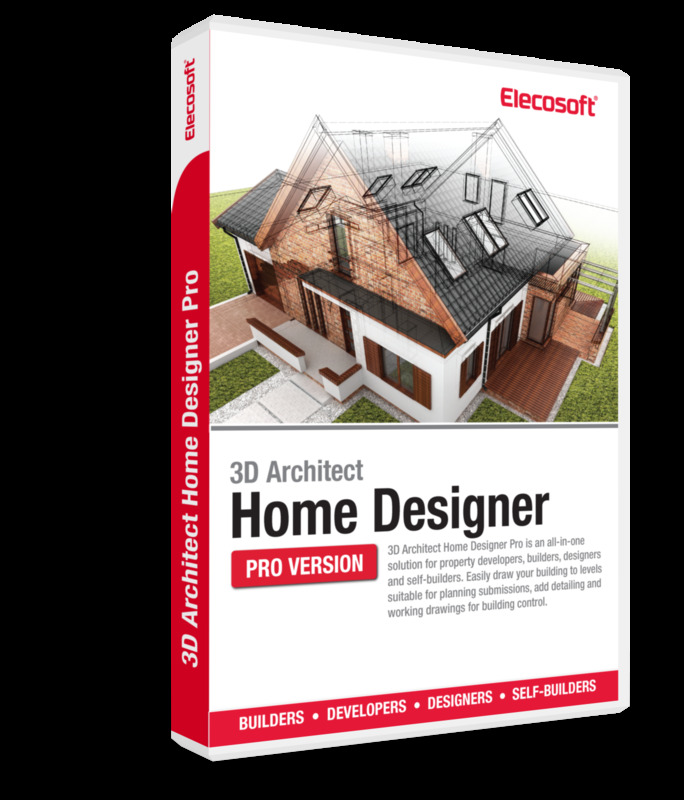 3D Architect Home Designer Pro floor designer software is a powerful design and communication tool for builders wanting to communicate building design projects to their clients. Draw walls, rooms and buildings quickly and accurately with dedicated, fully customizable tools. Then add other construction features with fast drag-and-drop modules. Additional floors and construction layers can be added easily. Change measurements, scale, color and textures at the touch of a button. With a single click of your mouse, enter 3D mode where you can add furniture, lighting, change the decor and present your design to clients by taking them on a virtual walk through of the building. 3D Architect Home Designer Pro floor plan software will enable you to easily draw your building to levels suitable for planning submissions and apply to building regulation information to your architectural 2D drawings. The modular tool-set of 3D Architect Home Designer Pro provides tools and icons for specific elements of the design in a logical manner. Easily identifiable, each tool will guide you through a particular part of the design process and will be familiar to anyone having used Windows based software. Each tool can be customized and adapted to your preferred drawing style with full flexible options, easily accessed at any time. Not all building plots are level and often a design will need to include split levels within the building. This could range from a simple step-down kitchen through to a hillside home staggered with the slope of the site. It is simple to overcome these design issues enabling you to create design solution perfectly suited to your plot requirements. With the ability to create multiple buildings per project file, 3D Architect Home Designer Pro is flexible enough to enable you to design entire developments and plan estates. DXF/DWG - Import standard CAD files, ideal to use as an existing basis for a plan, for site plans or for detail blocks for building control drawings. With fast and accurate drawing tools, creating scaled floor plans, elevations and cross-sections is one of the key strengths of 3D Architect Home Designer Pro. 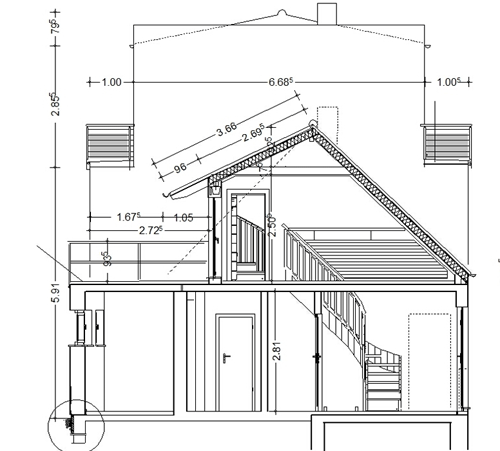 All plans and elevations are produced to scale with flexible control over scale, paper size and measurement units. The Plan Mode Assistant provides even greater control of your layouts, enabling you to produce single pages containing multiple views and floor plans. Ideal for planning applications, floor plan presentations to clients or service information for each trade. Tools available for creating construction detail drawings or import existing ones in DWG / DXF format. Can also be used with our Building Regs 4 Plans pack available for download through our website. Walls come complete with a number of standard settings in the library. These wall settings can be completely customized to change the library or create your own for future projects. Walls can be completely customized right down to specifying each individual layer of a wall. Advanced editor includes layering option for adding detailed hatching to walls and around windows/doors. The 3D Architect program provides you with the flexibility to produce drawings in your own way and when you need to change your plans, nothing could be simpler. With a complete suite of wall editing options available, amending, modifying or adding to your drawings is quick and intuitive. Simply select the tool that matches what you want to change and edit the wall. With options to enable you to change lengths, angles, wall ends, splitting walls, merging and trimming walls you can always ensure your designs can evolve with your requirements. 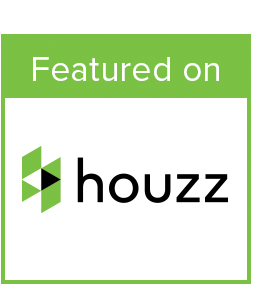 Advanced editors including variable stair constructions, complex roofs, dormers etc. Generate complex staircases. You can adjust the parameters and see the changes instantly in 3D. Supports many stair types. When placed, stairs will automatically create a ceiling cutout for the stairwell. 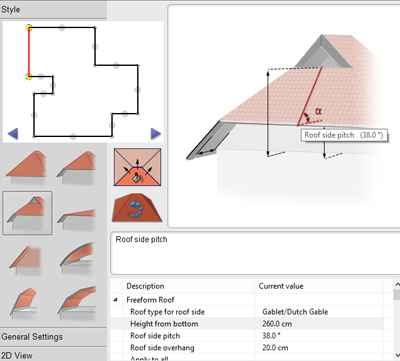 Taking our expertise in simplifying the creation of complex roof structures a stage further, our new roof designer provides clearer dialogue options to help understand the elements that can be controlled. With more flexible details available to each roof side, the construction and display of even the most complex of roofs is easier than ever before. Join multiple roof constructions together. Create unique designs using the powerful dormer window tools. With all of the standard dormer styles available from a single menu option. Select the correct profile and customize as required with full control over pitch, window size and quantity and advanced options such as roof breaks. 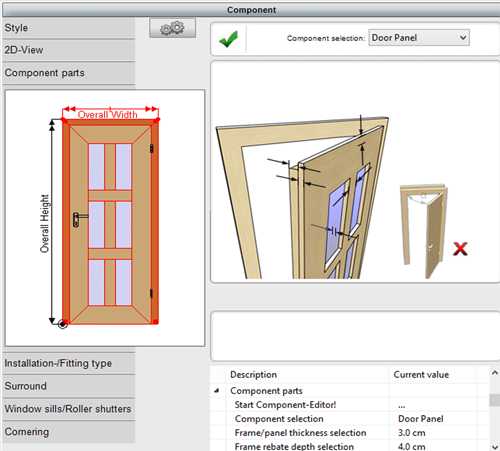 Extensive window and door customization tools allows for endless variations to be produced. Select an existing type from the library and change any aspect to ensure it suits your design requirements. Save your selections, preferences and new designs to the library for use in future projects. Scaled drawings often need to be annotated with precise information confirming sizes, angles, distances etc. 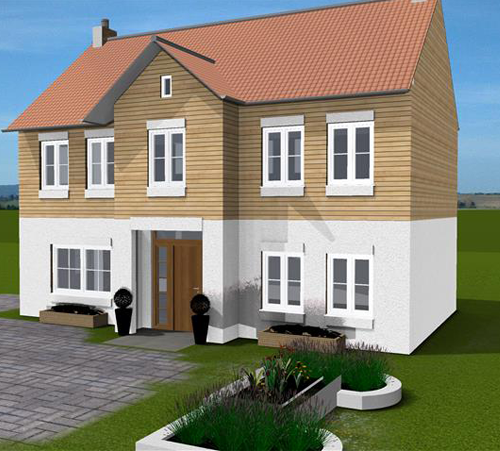 3D Architect software for home design comes complete with a full quota of dimension types to suit all requirements. From simple distance measurements right through to radial and arc dimensions, you can ensure you can fully annotate your drawings. 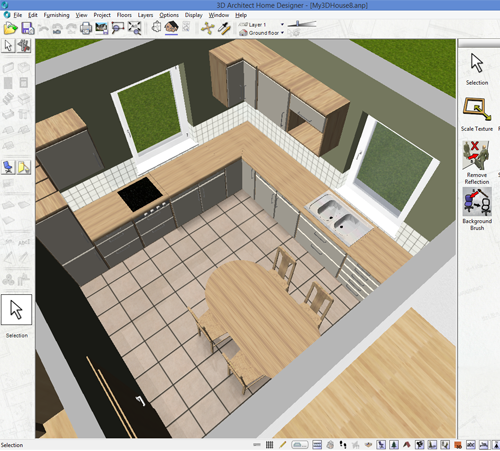 3D Architect Home Designer Pro enables you to draw in a more flexible environment than ever before. With two distinct workspaces, you can quickly and accurately design floor plans in our 2D construction mode and check the results instantly in the 3D model in design mode.